Alucard's Blood Donation? xD I'm sorry, but that just sounds funny. The remix is very serious, though. Great to hear that even after Konami's choice for Pachinko machines, we can still appreciate Castlevania tunes. I remember first playing Castlevania: Symphony of the Night and hearing that awesome theme getting you ready for an exciting game. Loving the chips. Oh my god! The beeping lights in this F-Zero remix. So nostalgic! Mute City can never get old. I wish Nintendo would just give us a new F-Zero game already. 1:30 gave me chills. So glad to see there are some people who still love F-Zero enough to remix it. I had almost not recognized this Kirby them. I normally hear people play it on the guitar, so having a dreamy synth sound was a new approach to me. At 1:29 of this remix, it reminds me of StarTropics. 2:27 sounds really interesting with the bass being different. It could have easily been turned into some electro house tune. I like how this went from the Menu and into Final Destination. They are probably the most popular themes in the Smash series. I think I've said it before, but I'll say it again, it's always a joy to hear Smash Bros. remixes. 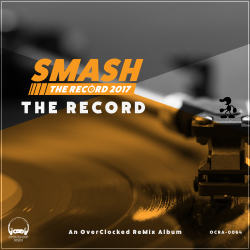 I'm excited to present Smash The Record: The Record! Smash The Record is a wonderful event that aims to raise funds for St. Jude Children's Research Hospital through their St. Jude PLAY LIVE program. We've put together a fantastic album of FREE remixes of a few of the games and series featured at Smash The Record to help highlight the amazing work done at St. Jude. If you enjoy this album (and I hope you do), please head over to Smash The Record's website, check out the stream, and donate!